One can never have too many friendship cards, so the other weekend I sat down to make a few to have on hand whenever needed. I felt like it’s been a long time since I used any florals in my projects so I settled upon the gorgeous Freehand Florals stamp set. 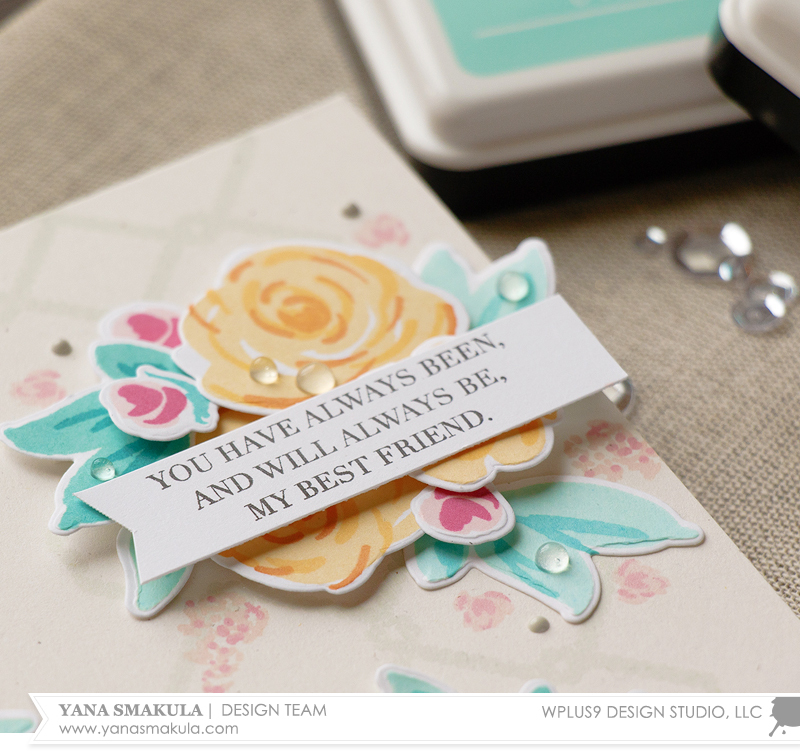 If you are an avid WPlus9 blog reader, you might remember a video Dawn filmed to best showcase this stamp set. 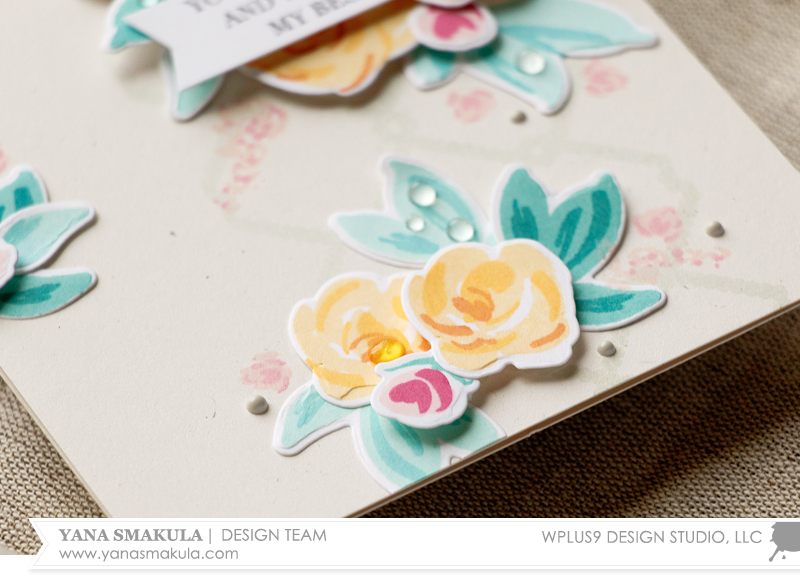 In her video she mentions that when using Freehand Florals with companion dies it is best to stamp your base images first, then to do die cutting and stamping the detail layers last to achieve perfect alignment. Following her advice I die-cut several of each element from this set and later stamped images using a yellow, teal and pink color combo. For my yellows I used: Hayride, Wild Mango, Pumpkin Pie; to stamp teals I used: Sea Breeze, Ocean Drive, Siren Song; for the pinks I went with: Shell Pink, Little Piggy and Sweet Gelato. You can find all of the ink colors and supplies listed and linked at the end of this post. I also picked one of my favorite background stamps, Dockside Backgrounds, and stamped the interlocking rope image in Fairy Dust color onto Oatmeal cardstock to create a faux garden trellis. I had some leftover Last Leaf green ink on my stamp, so my impression turned out to be somewhat green-gray. An unexpected, but rather pleasant surprise. To create a sentiment for this project I used a beautiful message from the Strictly Sentiments 4 set and stamped it in black ink. The sentiment reads “You Have Always Been and Will Always Be My Best Friend”. It's one of many wonderful "Mother's Day" sentiments included in this set. But used alone, works perfectly for a best friend card. Lastly, I added a few clear and light gray enamel dots using Nuvo Drops. This is so pretty Yana. Wplus9 has some beautiful floral stamp sets for sure. WOW...this is beautiful! I've had my eye on this stamp set, and you have inspired me with your creation. I have Pinned it for future reference. So pretty Yana! I love the colors against the oatmeal cardststock, love it, have to get some. I have and love the dockside set, so versatile. That sentiment is perfect for a bestie, have to get that too, lol. Thanks for sharing and always inspiring. Love your colour combo. So light and fresh. Thank you for the technique tips...I love your designs!